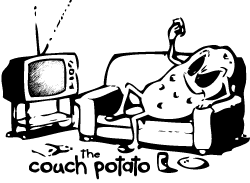 The Couch Potato in the extreme small wave version of the same general concept. It is wider, shorter, with a flatter rocker and a more parallel, yet continuously curving, outline than its big brother. Designed specifically a small wave surfboard, The Couch Potato (CP) is essentially a grovel version of the LayZboy, with a noticeably wider nose, with less entry rocker and a fuller forward foil, combined with a slightly wider tail. The outline and rocker combine for a board that is crazy fast , yet still controllable and maneuverable, in gutless surf. A waist high weapon that, like the LayZboy, can be surfed equally effective from both a centered stance or off the tail. Recommend to be ridden 2” shorter than the LayZBoy or the same size as Plank or Bottom Feeder.